Magic Pill was a dormant asset that hadn't made it to air on WBUR. Its short health-focused stories with fun tips and quirky music weren't the station's standard broadcast faire. 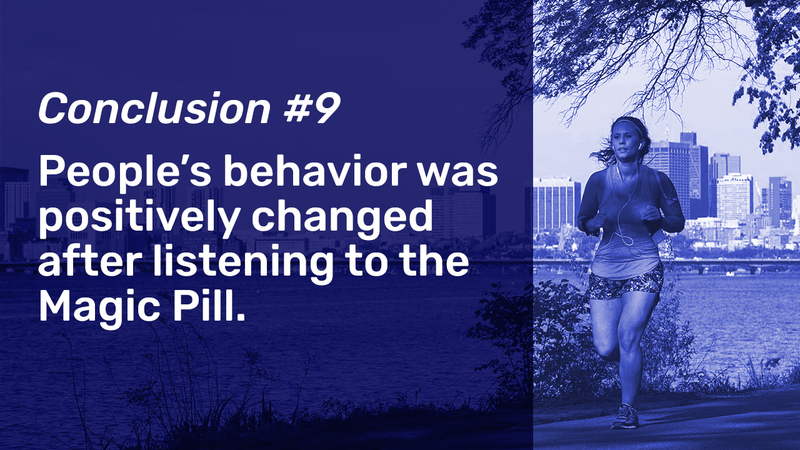 We helped breathe new life into this content by reinventing Magic Pill as a 21-day exercise challenge that was delivered to participants interactively via email. Taking risks with unproven content or new forms of interaction can be challenging for legacy media organizations. But that's often because they don't frame their experiments properly before they begin. 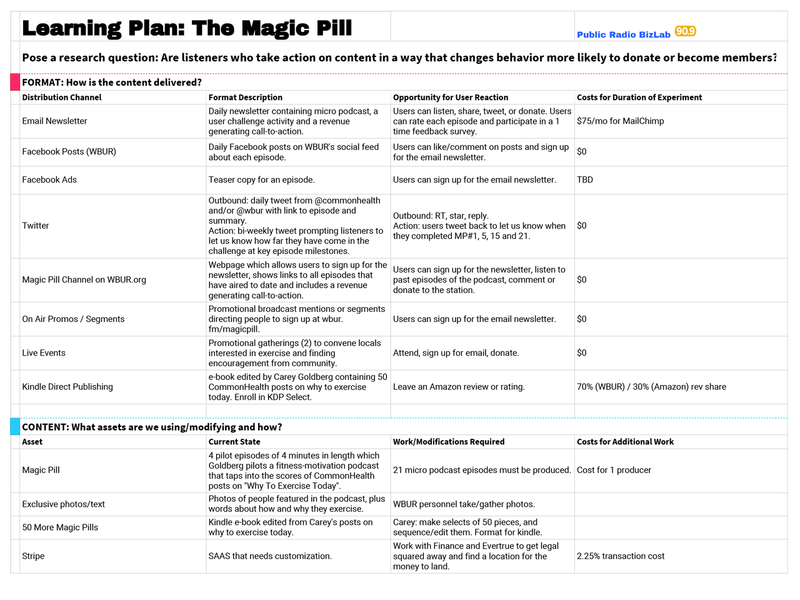 Instead of measuring success in terms of total dollars or downloads, we helped create a framework for knowledge building and structured the launch of Magic Pill as an opportunity to learn about WBUR's audience and test a hypothesis about engagement. Rather than taking the standard approach of maximizing downloads, we chose to focus on increasing engagement with the podcast series by exploring a more tailored form of delivery. Instead of asking users to subscribe through an app which automatically downloads new episodes as they air, we invited users to sign up for a simple interactive system that only delivered new content after they engaged with the previous installment. By matching the pace of content delivery to each user, we achieved an astoundingly high level of engagement. 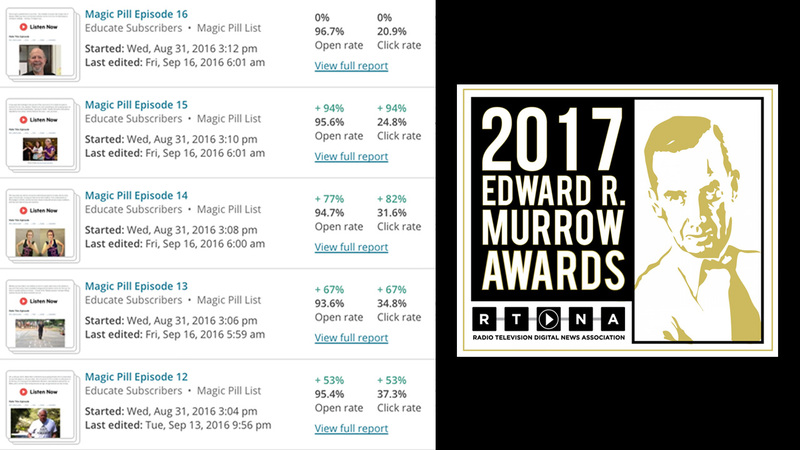 While the standard media industry open rate for emails is 19%, we achieved an average of 90% with the Magic Pill experiment! The significant results of this project earned WBUR a 2017 regional Edward R. Murrow award for Excellence in Innovation, and ensured that the series would be promoted alongside the other core offerings from the station. 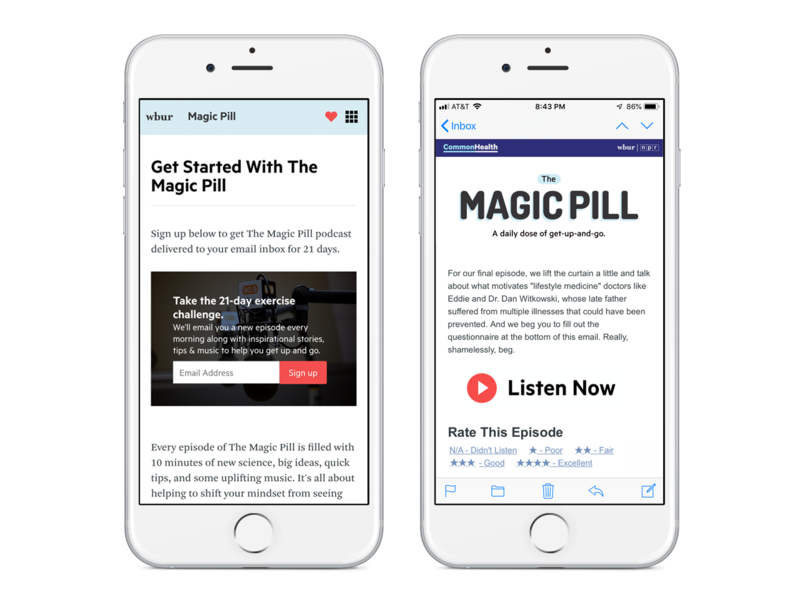 Magic Pill subscribers were highly engaged and eager to provide feedback. The 21-episode series offered ample opportunities for participants to rate content and reflect on the podcast experience. We analyzed all the interaction analytics and user data, and synthesized the results. By outlining 10 actionable conclusions, we hoped to help producers across the station learn from the research.